Hong Kong, 27 April 2016 - Hutchison Global Communications Limited (HGC) and 3 Hong Kong, the fixed-line and mobile communications divisions of Hutchison Telecommunications Hong Kong Holdings Limited (HTHKH; stock code: 215), today announced that the 3Home Broadband residential broadband service and “3” mobile service have collaborated with Google to launch the latest version of Google Chromecast in Hong Kong. This new offering comes bundled with residential and mobile service plans, or is available as a standalone offer. Customers will enjoy a new home experience featuring over-the-top (OTT) TV and gaming entertainment. "The new Chromecast brings your favorite entertainment from your mobile devices to the big screen with ease. With improved connectivity, a new design and an updated app, friends and family can share the fun of streaming movies, music, games and shows. The future of entertainment is streaming and Chromecast brings it all to you in a simple, affordable device." said Mickey Kim, Google Head of APAC Chromecast Partnerships. Phillip Shih, Vice President of KKBOX, said:” 3 Hong Kong and 3 Home Broadband launched the promotion of Chromecast. KKBOX is one of the content providers. With Chromecast, users’ smartphones and tablets become TV remotes; with which users can freely select KKBox music on TV, and take advantage of KKBOX’s rolling lyrics mode to turn their living rooms into party places. Also available at 3Shop is the new Chromecast, which comes complete with sleek design, a wealth of fresh content and up-to-date app that finds the best entertainment and streams faster with the utmost ease. Chromecast comes in eye-catching colours and turns any TV into a smart TV for a fraction of the cost of buying one. The latest design makes Chromecast easier to fit TVs with crowded ports and supports modern Wi-Fi standards. In fact, the latest version adapts to changing Wi-Fi conditions in a domestic setting, ensuring higher-quality video with less buffering. The apps make TV shows and music available from YouTube, KKBOX, Spotify, Netflix, Viki and Google Play Movies. Chromecast also offers a range of popular solo and multiplayer games including “Angry Birds Go” and “Just Dance Now”. Please call 1032 for more information on Google Chromecast bundled with home broadband and mobile service offerings. 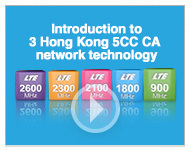 Alternatively, you can visit www.threebb.com.hk or www.three.com.hk, as well as 3Home Broadband’s Facebook fanpage at www.facebook.com/threebbhk or 3 Hong Kong’s Facebook fanpage at www.facebook.com/threehk. For more information on Google Chromecast, please visit www.google.com/chromecast. Hutchison Global Communications Limited (HGC) is a leading fixed-line operator, IT service provider, carrier’s carrier and one of Hong Kong’s largest-scale Wi-Fi service providers. HGC empowers local and overseas customers with one-stop international, corporate, data centre and residential broadband services. HGC owns and runs an extensive optical-fibre network, coupled with four cross-border routes integrated with three of mainland China’s tier-one telecoms operators, plus a world-class international network. The company is committed to developing cloud computing services and offering high-speed Wi-Fi service under the “HGC On Air” brand. HGC is a subsidiary of Hutchison Telecommunications Hong Kong Holdings Limited (stock code: 215), a group member of CK Hutchison Holdings (stock code: 1). For more information on HGC, please visit www.hgc.com.hk..
For more information on HTHKH, visit www.hthkh.com. 3 Hong Kong is a leading mobile communications service provider and the only local operator to own blocks of spectrum across the 900MHz, 1800MHz, 2100MHz, 2300MHz and 2600MHz bands. 3 Hong Kong offers cutting-edge data, voice and roaming services under the “3” brand via far-reaching advanced 4G LTE, 3G and 2G networks. 3 Hong Kong also works with renowned partners to offer a wealth of innovative mobile devices and value-added services, while providing high-speed Wi-Fi at “3HKWiFiService” hotspots to serve Hong Kong’s major areas. 3 Hong Kong is the mobile division of Hutchison Telecommunications Hong Kong Holdings Limited (stock code: 215), a group member of CK Hutchison Holdings (stock code: 1). For more information on 3 Hong Kong, please visit www.three.com.hk. The “myTV SUPER” box must be returned when contract expires. Get HK$300 off the standalone purchase price of designated handsets valued at HK$2,000 or more by presenting this “3HK $300 Standalone Handset Gift Coupon” at a 3Shop (not applicable to Apple products). Coupons valid until 31 December 2016. Coupons are available while stocks last. The “myTV SUPER Service Experience Guarantee Programme” guarantees that the subscriber shall enjoy smooth streaming of specific “myTV SUPER” video content stored in HGC’s data centre via a designated “myTV SUPER” box when connected to HGC’s Home Broadband Service. This means no buffering or freezing time for 10 seconds or more per hour, and no more than 10 buffering occurrences per hour. If the broadband service provided by HGC fails to achieve standards set by the “myTV SUPER Service Experience Guarantee Programme”, HGC shall compensate the subscriber with an amount equal to twice the service fee charged for the number of “affected days” calculated on a pro-rata basis. HGC provides the “myTV SUPER Service Experience Guarantee Programme” subject to terms and conditions, which may be revised periodically without prior notice. HGC reserves the right of final determination, and all rights to revise the testing standards and compensation principle, and to cancel the “myTV SUPER Service Experience Guarantee Programme” at any time. For details, please visit www.threebb.com.hk. Customers are required to subscribe to designated mobile devices, monthly plans and specific value-added service packages (if applicable). Also required are a designated contract commitment and prepayment, as well as payment of the first month’s fee and an admin fee of $18 per month.